Yesterday, I headed south of town for an early a.m. meet-up. 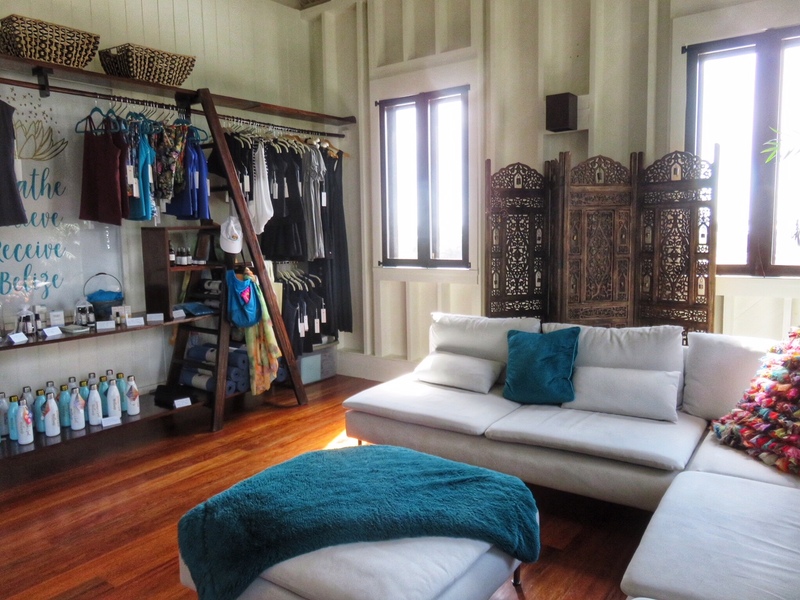 A warm sunny January day – I turned through the imposing gates of Mahogany Bay Village and pulled up to Science and Soul Wellness – the GORGEOUS yoga studio, spa and meeting spot. I was meeting Paulette and her husband, the owners and tagging along on a shoot. For the half hour long TV show out of Boston’s ABC affiliate called Chronicle. They have been in Belize for a few days now – beginning at the GORGEOUS Chaa Creek Resort in Cayo, Western Belize (below is my post from my last visit there) and now Ambergris Caye. The anchor, Anthony Everett, was here for this leg of the trip. They spent their first night at The Truck Stop, this stop was segment #2 and then they were off to meet with Jerry Jeff Walker at his Belize home south of town. As Bostonians shiver through one of the coldest winters on record – today’s temperatures don’t even get above freezing there – a taste of Belize might be just what they are looking for. We were headed out to showcase the MBV Beach Club and the Stand Up Paddle board yoga class S&SW conducts in this ridiculously stunning spot. The west side of Ambergris Caye is absolutely stunningly gorgeous. And I am ALWAYS up for a boat trip over. Here’s what I saw. I took a bunch of pictures but it’s just so pretty! Climb the stairs, they have the HUGE upstairs space. The most recent class had just finished and ladies and men were lounging on the couches drinking lightly scented waters…all so very…namaste. I just like to sit and pretend this is my living room. We gathered into two boats – love this painted on the studio’s ride. It was quite windy but we twisted through the canals and emerged by Cayo Espanto. The beach club is just about 5 minutes more heading north. Set in a cove…it’s just a crazy photogenic spot. The west side of the island is almost its own ecosystem. Craggy limestone and sand…stunted prickly trees and shrubs…it’s beautiful. I was directed to lay in a hammock for some overhead shots. The show did some interviews – Paulette told of her story moving from just outside Boston to Ambergris Caye. I kept the focus on my assignment. The SUP Yoga demonstration started and finished and I was still in my hammock. Such is life. All in all we were there for about 3 hours. Absolutely gorgeous. But FIRST I asked the question that all of you have been asking. Is it possible to go to the beach if you aren’t staying at Mahogany Bay? The answer is yes. For those who love YOGA, you can also come to Science and Soul Wellness and take a class. The sunrise yoga (if there are 4 or more people) takes place at the beach club – if less than 4, you practice at the studio) and the SUP classes are at the beach club. Rebecca, last time I was at Shake, I noticed a sign that said the pool was only for Mahogany Bay guests. That’s so unBelize. Usually, if you are at a resort’s bar, you are welcome to take a dip in the pool. What do you think about that!